The Mamelukes Flag: It consisted of a cloth embroidered with golden threads. The Phoenician Flag: This flag was blue, symbolizing the sea, yet the red color was later added to it when the purple color was discovered. The Rebels' Flag during Prince Ibrahim Era: It became a white cloth with a red carnation at the bottom right corner. The Rebels' Flag: It consisted of a cross and a sword, both white, on a red cloth. The Shehabian Flag: Consisted of a blue cloth with a white crescent. The Lamaïte Flag: It consisted of a white cloth with a drawing of a Lion. The Abi Kand Flag: Consisted of two vertical and equal bands, one yellow and one blue. The Tannoukhian Flag: Consisted of 5 colors divided vertically in equal bands of white, blue, yellow, red and green. The National Maaniïtes Flag: The Kaïssy Party Flag. The Maaniïtes Flag at the end of the Maaniïtes Emirate: End of the 17th century. 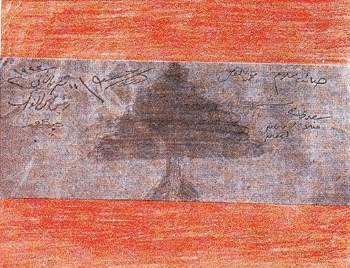 The Ottoman Flag: Consisted of a red cloth with a white crescent and white star in the center, and remained as such until their departure in 1918. The Jumblatian Flag: It consisted of a red flag with a green frame; a sword and a dark green hand in the middle. The Lebanese Cedar: Following the fall of the Ottoman Empire, it consisted of a white cloth with a green cedar in the center. The Lebanese flag during the French Mandate: It was similar to the Blue, White and Red French Flag with a green Cedar in the middle, and was designed by the president of the Lebanese Nahda (renaissance) Movement, the late Naoum Mukarzel. The National Flag: White and Red with a cedar in the center. The Cedar consists of two thirds of the size of the white band. TheIndependence Flag: As drawn by the MPs [members of parliament] using pencils during the parliamentary session. The above list is not chronological. The eighth flag is the Tanukh flag, supposed to date from the 4th century AD. The Shihab Flag ca. 1697-1842 is four positions before the Maanid Flag which it replaced, etc. Moreover I believe these are not successive (pseudo-) national flags of Lebanon, but flags of different lordships with territorial possessions in nowadays Lebanon, several of which co-existed in time. A different question is how old are some of the flags supposed to be – the Tanukh flag, the Phoenician flag – and how reliable their existence is! In 1685 the Lebanese (?) flag was published in Florence: red, with a cedar over a bull. Arsilanians: green with white flower in center.